Look up in the sky! It’s a bird…it’s a plane…No! It’s a giant crane! If you’ve been watching the progress of our new building on our Webcam you might have noticed two very large additions to the construction site – a 210-foot and a 230-foot white, tower crane. 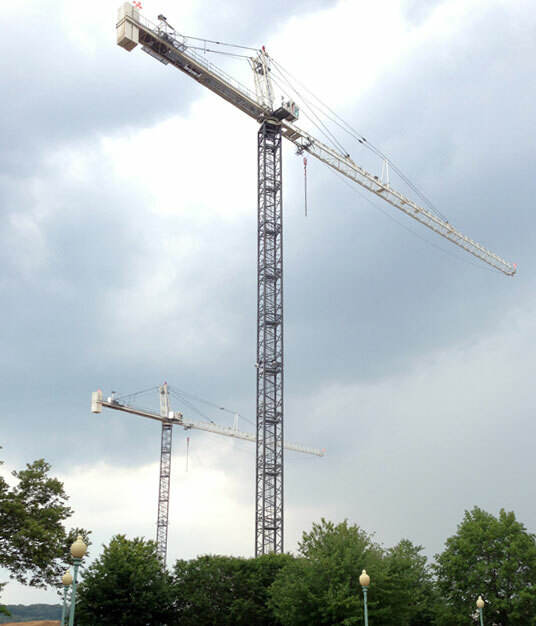 The smaller one is about as tall as 300 Tonka toy cranes stacked on top of each other! “Both cranes will be responsible for transporting material into the construction site,” said Tom Conti, construction superintendent. Two workers will operate each crane. The cranes have already begun moving materials to build the elevator pits for the new building. According to Conti, elevators are often one of the first stages of building construction because the structure for the shafts is underground. This week the tower cranes began working on the building foundations. Currently, there are about 30 workers on the site.